"He treats me like a child. Of course. That kind of man likes only women of experience. Well, I'm getting there as fast as I can." While there are a handful of names from the silent era that are still familiar to the public at large, there are many more who were highly popular in their day but are nearly forgotten today, even by film buffs. One such actress of this latter group was Olive Thomas, who died under mysterious circumstances in 1920 at the age of 25 in one of the earliest great Hollywood scandals. This DVD from Milestone combines a documentary regarding Thomas life and career (she made 17 feature films, some of which survive) and one of the most notable of her pictures, released just a few months before her untimely death. The sympathetic documentary, Everybody's Sweetheart (the name of Thomas' last, and posthumous, film) is another in the series of films sponsored by Hugh Hefner regarding early actresses. Like others that Hefner was produced, this look at Thomas is fairly comprehensive, though it's hampered by the fact that precious few people who actually knew her survive, and few seem to have been willing to talk about her in the wake of her death. So other than fairly dry facts, narrated by Rosanna Arquette, we mostly get dimly remembered third-hand anecdotes from members of the family, which doesn't inspire huge amounts of confidence. On the positive side, much of Thomas' career from 1916 to 1920 was highly public, and there are the film clips and the news stories of the time that help flesh out Thomas' story. The progression follows nicely as she leaves the steel mills of Pennsylvania for New York City, where she is immediately acclaimed as the most beautiful woman in New York. Rapidly gaining fame as a Christy Girl and a Vargas Girl, she became a prominent beauty in the Ziegfeld Follies and mistress of Florenz Ziegfeld himself. But a film career with Triangle and the Selznicks beckoned, and so did a whirlwind romance and secret marriage with Jack Pickford, Mary's brother. The documentary makes Mary Pickford out to be a vilely jealous shrew who wouldn't even allow Olive and Jack to be buried together. If there's truth in that, Pickford's biographers seem to have pretended not to notice. The real gem of the program is the set of film clips from several of Thomas' pictures, which help indicate why she was highly popular (even if, rather short and squat, she would hardly be considered a paragon of beauty today). Supporting Thomas' reputation as an actress worth remembering is the inclusion of her 1920 feature, The Flapper, which became an icon of an entire decade. Thomas stars as 16-year-old Genevieve King, boy-crazy and both fond of neighbor Bill Forbes (Theodore Westman Jr.) and crushed out on older Richard Channing (William P. Carlton). Sent off to the boarding school of Miss Puddles (Marcia Harris), Genevieve is rechristened Ginger and sets about growing up too fast. Her friend Hortense (Katherine Johnston) runs off with Tom Morran (Arthur Johnston), along with all the money and jewelry in the boarding house's safe. Ginger runs into them in New York, and when the miscreants try to frame her for the theft, she decides to play up the part and uses the goods to present herself as a decadent flapper in a desperate effort to intrigue Channing. While there's plenty in the story (by screenwriter Frances Marion) that is predictable, Thomas is certainly entertaining to watch, vacillating between innocence and experience at will. She uses her magnificent eyes to good effect, and her efforts of growing up too fast seem to parallel the mood of the incipient Jazz Age. Her flapper is a quintessential vamp, complete with histrionics and a Theda Bara sensuality. No doubt more than one 1920s girl patterned herself closely after Thomas' character. Not only is Ginger happily tempted into being a bad girl, she is clearly having a great time doing so, and contrary to Edwardian mores she is not punished for her transgressions. The film is complete with gorgeous art titles, though the prominent theme of suicide is a bit disturbing in light of the questions regarding whether she killed herself intentionally or by accident (or possibly was murdered). The rest of the cast isn't terribly interesting, though there are two small boys who act as a Greek chorus through parts of the film and they're quite funny. It's an entertaining enough picture, thanks appropriately enough mainly to Thomas herself. Image Transfer Review: For the most part, Everybody's Sweetheart looks quite fine. The exception is that on stills there is quite a lot of aliasing and visible line structure. The Flapper is nicely windowboxed, and while it has the expected speckling and wear, it overall looks quite nice for a film of its vintage. The tinting is quite subtle and attractive. The print is from the George Eastman House collection. Audio Transfer Review: The documentary sounds quite fine, as it should. The feature has a piano score by Robert Israel, comprise of classical themes (including Beethoven, Schumann, and Grieg) and some popular tunes. It's uninspired but relatively serviceable. The piano sounds a bit thin and is lacking in sonority. Extras Review: Some nifty and unique extras make this disc a standout. 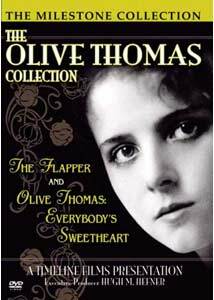 The first item is a set of "reenactments" of two anecdotes, from the memories of cinematographer Billy Bitzer and screenwriter Lenore Coffee, starring Thomas' great-grandniece as Olive. An 11m:01s segment contains a reading of the memories of Olive's first husband, Bernard Krug Thomas, which fills in some of the years of her life that the documentary skims over. A pair of "music videos" provide performances of two songs written about Olive Thomas and published back in her heyday. The first is set to stills and illustrations, while the second accompanies scenes from the serial Beatrice Fairfax that feature her as a guest star. Finally, about 20 stills are provided in a slideshow. A forgotten member of the silent screen gets her due, finally. Some nice and substantial extras really flesh out this attractive package.